..... Balance Trading .....: Where are we heading? Down Down Down as shown in thick solid pink on the SPX montly chart below. First of all SGS is short (been short as of close of 5/14/2010), so you've got to respect that. 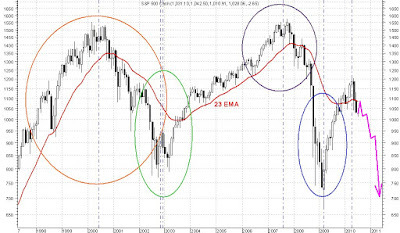 Secondly, SPX solidly closed below its 23 EMA on the SPX monthly chart; and on the SPX daily chart, 50 D-SMA is now below 200 D-SMA (Death Cross). 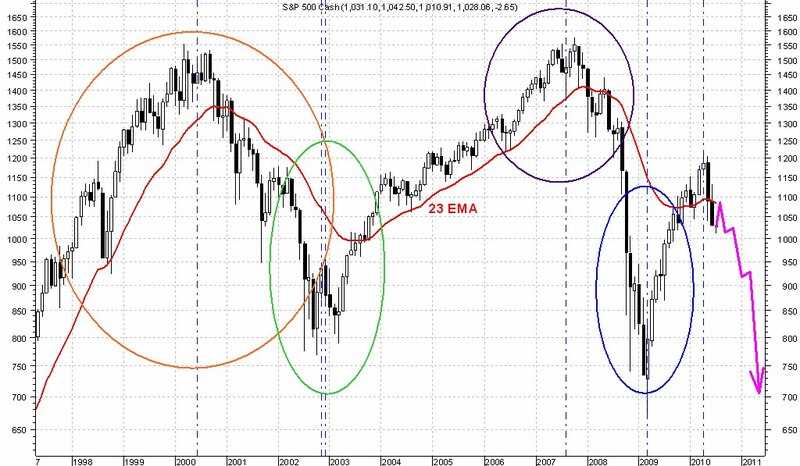 Thirdly, notice the symmetric nature of SPX moves from its major bottoms and tops in the last 12 years. That symmetry will repeat itself as SPX goes down to retest March 2009 lows around 700 to 650 sometime in late 2010 to early 2011.